Today’s defence related news includes coverage of NATO’s 70th anniversary summit to be held in London. The BBC, Independent, Guardian, Daily Mail, Daily Express and the Press and Journal all report that NATO Heads of State and Government will take place in London in December 2019 in the Alliance’s 70th anniversary year. The UK is one of the founding members of NATO and I am very pleased that the Secretary General has asked us to host a meeting of NATO leaders this year to mark its 70th anniversary. For 70 years NATO has been the cornerstone of our national security. But today’s challenges are very different from those we faced when the Alliance established its first headquarters in London. The UK has played a central role throughout NATO’s history as it has adapted to deal with new and complex threats to our security. So as we pay tribute to the service men and women who have worked so hard over so many years to keep us safe, December’s meeting is an important opportunity to determine the steps we must now take to modernise the Alliance and ensure its continued success. Since its inception 70 years ago, NATO has preserved peace, prevented conflict and protected its people. Its unrivalled success has proved that when our allies are safer, we are safer. The UK has played a leading role from the start and continues to do so today from RAF jets taking flight to protect NATO airspace to over 900 troops leading NATO’s enhanced Forward Presence in the Baltics. But in an ever-changing world we must continue to work together, which is why I am delighted the UK has been invited to host a meeting of NATO leaders later this year. 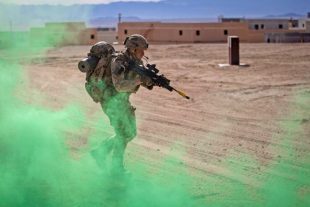 A British Royal Marine with 45 Commando assaults an objective while conducting the Urban Field Exercise (FEX) during Integrated Training Exercise (ITX) 2-19 on Range 220 aboard Marine Corps Air-Ground Combat Centre Twentynine Palms, California, U.S.